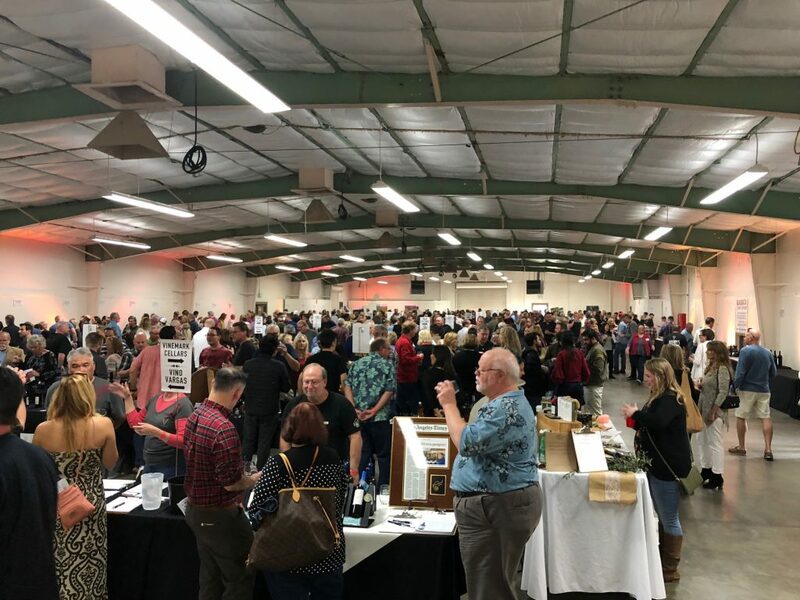 Over 60 Garagiste winemakers – aka garage winemakers, most of whom don’t have tasting rooms and don’t produce over a certain number of cases annually – would be pouring for the 8th Annual Garagiste Festival in Paso Robles. We’d covered this event in Los Angeles and Paso Robles over the years and oftentimes these wineries would grow – they would have to leave the event to make room for new Garagistes. This turnover meant an influx of new discoveries every year, as well as seeing some winemakers that have remained small and we could then taste their new vintages. The Garagiste events, co-created by our very own Doug Minnick of Hoi Polloi and the Double Trouble Wine Room on Main in Downtown Newhall, is also the non-profit brainchild of partner Stewart McLennan. Artisan Uprising – RR: 2015 Tempranillo and 2017 Sangiovese. Ascension Cellars – RR: 2012 Trinity GSM and 2012 Soul Shaker Cabernet Syrah blend. Bon Niche Cellars – RR: They did a vertical of their Bordeaux Blends including a 2010, 2012, and 2015. I liked the balance of the 2012 the best. Caliza Winery – We have tasted Carl Bower’s wines off and on over the years at this event, happy to have tried them today as enjoyed: 2015 Azimuth GSM, 2015 Syrah and 2014 “Cohort” blend of Petite Sirah, Mourvedre and Syrah. All wines are from estate vineyards. Copia Vineyards – RR: 2016 “The Story” blend of Grenache and Syrah. Diablo Paso – RR: 2014 Tempranillo Gran Reserva. Learned that these were grapes sourced from Napa and had spent 42 months in oak. My second favorite of the rare and reserves. 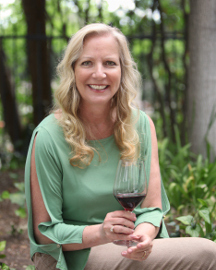 Dusty Nabor Wines – RR: I’ve liked all of Dusty’s wines at Garagiste, this time it was a 2016 NSO, meaning for “No Special Occasion”, California Red Wine for $19 that was the winner! Gary Kramer Guitar Cellars* – RR: A barrel sample of Malbec? I hate barrel samples as it’s all oak to me sometimes, this one was nice indeed. Hoi Polloi Winery – I stopped at the table to say hello, but I have had their wines many times as they have a tasting room five minutes from my home in Santa Clarita. Hoyt Family Vineyards – RR: 2009 Estate Cabernet Sauvignon was my favorite of the entire rare and reserve tasting. Kaleidos Winery – RR: 2015 Praying Mantis Syrah. Leverage Wines – RR: 2017 Chardonnay and 2016 Trajectory GSM blend. MCV Wines – RR: 2011 1105 Petite Sirah blend. Also enjoyed to of their 2015 Petite Sirah – one from the Rosewynn Vineyard and the other from the Gemeny Vineyard. Merisi Wines* – RR: 2016 Los Carneros Grenache. On Your Left Wine Co. – RR: A fellow wine taster sent me here. 2015 Two Wheeler Grenache Mourvedre that hadn’t been released but I thought was ready and a 2014 Single Track Syrah. Pagter Brothers Winery – Of course I stopped in to say hello, even though the share a tasting room with Hoi Polloi (see my notes above) and was rewarded today with a wine club only pour of their 2016 Petite Sirah. Well done! Powell Mountain Cellars – RR: 2010 and 2011 Pinnacle Bordeaux blends. RF Wines – Enjoyed their 2015 Exceed Malbec, 2016 Cabernet Sauvignon and their 2015 Petite Sirah was my favorite at the grand tasting. RN Estate Winery – 2015 Estate Cabernet Franc, 2014 Cuvee des Trois Cepages Bordeaux Blend and 2014 Malbec. T. Berkley Wines* – 2016 Cabernet Franc, Napa. Tlo Wines – 2016 Cabernet Sauvignon, Lucas and Lewellen. TW Fermentations – RR: 2015 Cultivator blend and a newly released 2015 Merlot. Volatus Wines – RR: 2008 Reserve Red – a Syrah and Petite Sirah blend. SANTA BARBARA, Calif. (PRWEB) – After twenty five years and the delivery of 8 million bottles of wine to his club members, Gold Medal Wine Club’s David Chesterfield feels a responsibility to keep doing what he and his wife Linda have always done: Focus on introducing their members to the dedicated artisan winemakers who form the core of the California wine industry. Now embarking on the beginning of his second quarter century in the Wine Club channel, Chesterfield believes his past success and future success will depend entirely on providing what he believes is at the foundation of what wine lovers want. David and Linda Chesterfield established Gold Medal Wine Club in 1992 and were one of the first wine of the month clubs in existence and remains as one of the oldest, most respected, independent wine clubs in the country. Over the years the Chesterfields have added new club levels to meet the demands of changing tastes and interests. Today, six different clubs are offered: Gold Club, Platinum Club, Diamond Club, International Club, Pinot Noir Club and the Garagiste Club. They range in price from $39 to $179 per two-bottle shipment and all of them feature wines produced by genuine artisan winemakers at significant discounts off their winery retail pricing. The focus on discovering artisan wineries located up and down the West Coast has been at the heart of the 8 million bottles shipped over Gold Medal’s first 25 years and define its ongoing success. Together, David and Linda have introduced their club members to hundreds of artisan wineries including the likes of Keller Estate and Couloir from the Petaluma Gap AVA, Napa Valley’s Blackbird and Odette, Santa Barbara’s Press Gang Cellars and Cordon, and Anderson Valley’s Fulcrum and Philo Ridge wineries. Despite increasing competition from new, bulk wine-based competitors in the wine club sphere, Gold Medal Wine Club is embarking on its second quarter century with the belief that more and more wine drinkers will demand an authentic artisan experience from their wines and their wine clubs. Vintage Eve Circa 7/2015: Garagiste in the Wiltern! There is nothing like a wine event held in a new venue to rev my engines/salivary glands, and The Garagiste Festival Urban Exposure held inside the Wiltern theater, with the auditorium seats moved over to the side to accommodate wine tables and guests, made for a grand showcase for so many grand wines! 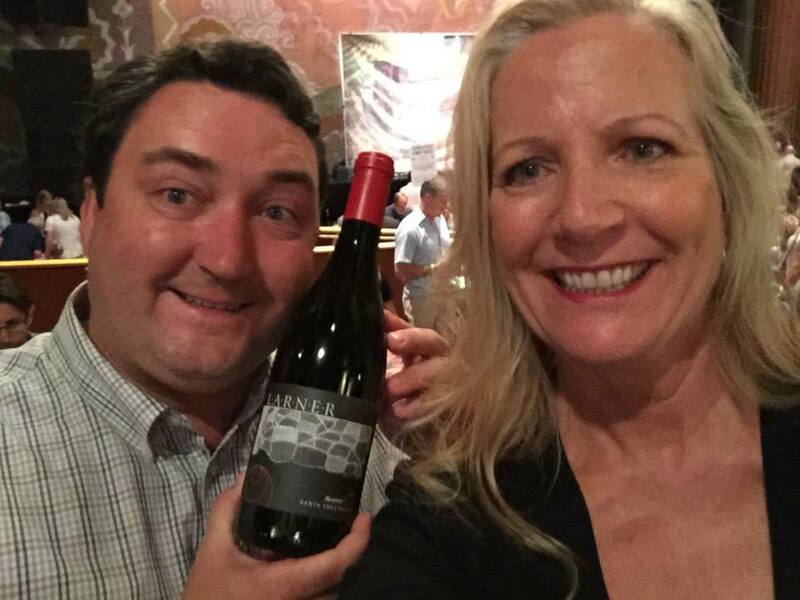 Michael D Larner sharing his Larner Vineyard & Winery 2010 Reserve Syrah – OMG delicious. We were offered an early tasting of the “Rare and Reserve” (R&R) wines and took full advantage of it. To the point that after selecting no less than 30 wines to taste, I took a break to abate palate fatigue…and still had difficulty going back to the tables to taste everyone’s full line-up. My conclusion had to be that if I loved their R&R I would most likely dig more! Rare and Reserve (R&R) Note: Wines denoted with the acronym GSM are a Rhone blend of Grenache, Syrah and Mourvedre, but Grenache is not automatically predominant though listed first. Alma Sol Winery: 2009 Cabernet Sauvignon, Napa Valley – $60 – 50 cases. Alta Colina Vineyards: 2011 Block 2 Bio Syrah – $55 – 110 cases. Archium Cellars: 2012 Haven Grenache – $34 – 74 cases. Bon Niche Cellars: 2010 “Voutes” Bordeaux Blend – $50 – 97 cases. Caliza Winery: Loved tasting the older 2006 Estate Syrah – $70 – 230 cases. 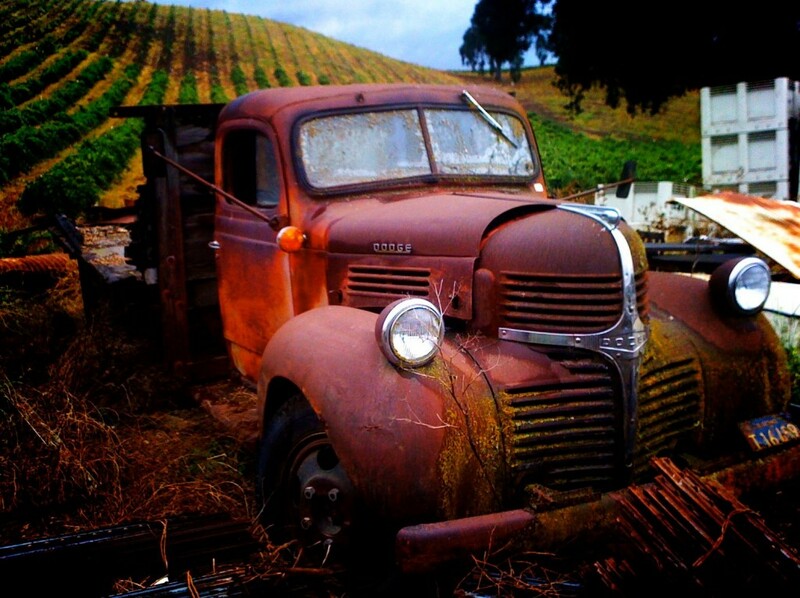 Cholame Vineyard: 2012 Grenache – $45 – 90 cases. Cordon Wines: 2011 Highway 1 Blackbird Cuvee of Merlot and Cabernet Franc – $26 – 90 cases. DENO Wines: 2010 Two Bill’s Zinfandel Grenache blend – $35. Dilecta Wines: 2011 Tillers Grenache Syrah blend – $46 – 75 cases. Halcon Vineyards: Loved them all: a Marsanne/Roussane blend, Pinot Noir, Grenache Mourvedre blend, Syrah and a Petite Sirah as well as the R&R 2011 Alturas Syrah – $70 – 180 cases. Harrison Clarke Vineyards: 2012 Syrah Whole Cluster – $68 – 25 cases. Imagine Wines: Another lovely older Syrah, the 2007 “Winged” Syrah, Paradise Mountain – $80 – 146 cases. Incendium Wines: 2012 Cabernet Sauvignon, Napa – $32.50. Kaleidos Winery: The entire line-up (Pinot Gris/Viognier blend, two GSMs and two Syrahs) including the 2012 Preying Mantis (Syrah) R&R – $55 – 24 cases. Kessler-Haak Vineyards: 2013 Cabernet Sauvignon, Starlane Vineyard – $45 – 47 cases. Mattina Fiore: 2012 Grenache, Murmur Vineyard – $60 – 312 cases. Prizm Winery: 2014 Cabernet Sauvignon, barrel sample $60 – 175 cases. Pulchella Winery: 2013 Block 6 Syrah Reserve, La Vista Vineyard, yet to be named. OMG can’t wait for this one! Ser Winery: A low acid and low alcohol but incredibly tasty 2014 Dry Orange Muscat $16 – 45 cases. Shai Cellars: 2009 Adome blend of Syrah and Grenache…I’m a long time fan of winemaker Shawn Shai Halahmy. STANGER Vineyards: 2009 Pinot Noir, Library Reserve – $114 – Club Only. The only Pinot I’ve ever had that doesn’t taste like a Pinot! Deep, dark and spicy. A must try! Hubby loved their 2010 Reserve Cabernet Sauvignon. Tercero Wines: 2009 Les Deux Comtes Rhone blend – $45 – 88 cases. The Central Coast Group Project (CCGP): 2013 Barrel sample. Tlo Wines: 2012 Reserve Petite Sirah – $35 – 90 cases. Vinemark Cellars: 2009 Primitivo – $32 – 1st Vintage. 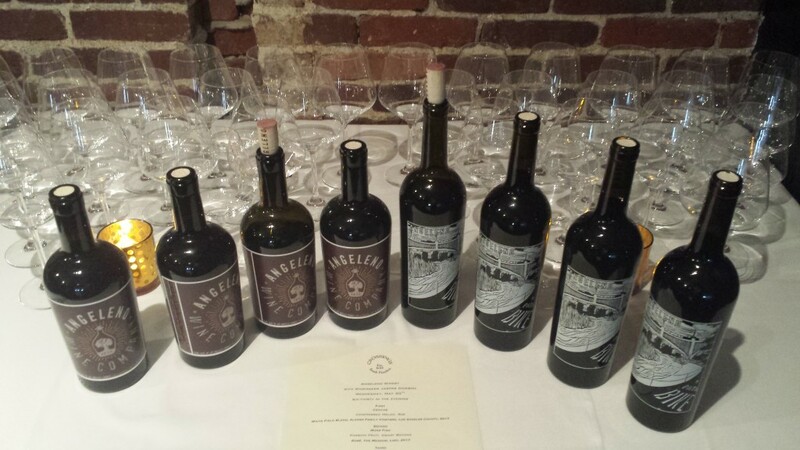 Vines on the Marycrest: Sangiovese – $36 – 60 cases None available so instead I tasted and LOVED everything else Victor and Jennifer Abascal shared: 2014 Summertime GSM and Zinfandel blend, 2012 Zinfandel, 2010 Syrah and 2012 My Generation blend of Zinfandel, Syrah, Mourvedre and Petite Sirah. Thanks must go out to the fabulous planning team that includes founders Doug Minnick and Steward McLennan, event director Lisa Dinsmore, great PR from Melanie Webber and a wonderful group of winemakers, wine reps, food vendors and knowledgeable volunteer sommeliers. Alma Fria Winery, Alma Sol Winery, Alta Colina Vineyards, Archium Cellars, Artisan Uprising, Ascension Cellars, Bellissimo Cellars, Blair Estate, Bon Niche Cellars, Caliza Winery, Carucci Wines, Casa Dumetz, Cholame Vineyard, Cloak & Dagger Wines, Coda Wines, Cordon Wines, Cutruzzola Vineyards, DENO Wines, Diablo Paso, Dilecta Wines, El Lugar, Falcone Family Vineyards, Frequency, Graef Wines, Halcon Vineyards, Harrison Clarke Vineyards, Imagine Wines, Incendium Wines, Kaleidos Winery, Kessler-Haak Vineyards, Larner Vineyards, Last Light Wine Co., Levo Wines, Maidenstoen Wines, Mattina Fiore, MCV Wines, Moonwalker Cellars, C. Nagy Wines, Overland Wines, Pace Family Wines, Powell Mountain Winery, Prizm Winery, Pulchella Winery, Rendarrio Wines, Ryan Cochrane Wines, Ser Winery, Shai Cellars, STANGER Vineyards, Tercero Wines, The Central Coast Group Project, The Farm Winery, Theopolis Vineyards, Tlo Wines, Travieso Winery, Turiya Wines, Two Shepherds Wines, Valley Floor Vineyard, Vinemark Cellars, Vines on the Marycrest and Weatherborne. PASO ROBLES, Calif. (PRWEB) – The Garagiste Wine Festival has been named the US’ “Best Wine Festival” in USA Today’s 10Best Readers Choice Awards. 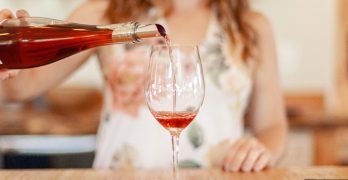 Launched in 2011 in Paso Robles, the Garagiste Festival was the first to define, and shine a spotlight on, the American “garagiste*” wine movement and features the wines of commercial artisan winemakers who make under 1500 cases. At its festivals across California – from Paso to Los Angeles to Sonoma to Solvang – The Garagiste Festival has introduced hundreds of outstanding under-the-radar California artisan winemakers to thousands of passionate wine consumers, members of the trade and media. Dubbed “tasting nirvana” ‘strange and wondrous,’ and “one not to miss” by the LA Times, the Garagiste Festival is renowned for its renegade spirit, passionate winemakers, handcrafted wines and rules-breaking, ‘no snobs allowed’ ethos. The non-profit festival, which celebrates its 21st festival in Paso Robles in November, has raised over $125K to support the education of future winemakers through the Garagiste Festival Scholarship fund of the California Polytechnic State University at San Luis Obispo Wine and Viticulture Department. “We are eternally grateful to our supporters, a network that has continued to expand and which has had a real impact not only on the wine world, but also, through the Garagiste Scholarship Fund, on the future of winemaking,” continued Minnick. A panel of experts partnered with 10Best editors to pick the initial 20 nominees, and the top 10 winners were determined by popular vote. 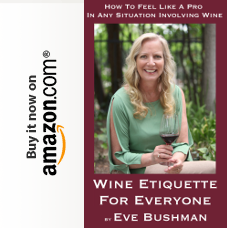 Experts Jill Barth, a Provence Wine Master; Karen MacNeil, one of the foremost wine experts in the U.S.; and June Rodil, a Master Sommelier were chosen for their knowledge of wine and the American wine scene. The US’ Best Wine Festival marks its 21st festival, and 8th anniversary, at its home base in Paso Robles, November 9th through the 11th, with three days of events, including a Grand Tasting that showcases over 60 micro production winemakers (20% pouring at the festival for the first time), tasting seminars, a Rare and Reserve tasting, a Keep It Rockin’ After Party, and more. 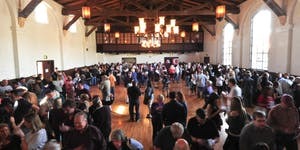 Tickets are on sale now at https://www.eventbrite.com/e/the-8th-annual-paso-garagiste-wine-festival-tickets-49769338431?aff=web. For full schedule details, go to http://californiagaragistes.com/2018-paso-fest. For special discounts and updates on Garagiste Festival events and news, sign up for The Dirt at http://garagistefestival.com/sign-up/, or follow us on Twitter (@GaragisteFest) or Facebook (http://on.fb.me/1rgBC80). Saturday, July 21st was a great day that ended on a very sad note. Karen and I had a wonderful time at the latest incarnation of The Garagiste Festival: Urban Exposure in Santa Monica and followed that with an early dinner at one of our new favorite restaurants, Lunetta, also in Santa Monica. By the time we got home though, social media was blowing up with the sad news of the passing of Pulitzer Prize winning food critic Jonathan Gold. Now, this article is not intended to be a tribute to Mr. Gold. Far better writers than I am, many who knew him personally, have penned heartfelt remembrances that you should seek out; his influence on the Los Angeles restaurant scene is incalculable and he will be sorely missed. But it got me thinking that some of the traits that Jonathan praised in the restaurants he wrote about are also ones Karen and I look for in wineries: authenticity, creativity, risk-taking, passion. And nobody exemplifies these attributes better than the Garagistes. The Garagiste Festival started in 2011 with its first event in Paso Robles, focusing entirely on the little guys – “the ultra- premium, hard to find, micro-wineries”. Since then, it has expanded to annual events in Solvang, Los Angeles and most recently, just prior to the latest L.A. event, an inaugural event in Sonoma County. These wineries make less than 1500 cases per year, many much less. This means that in most cases, you won’t find them pouring in a tasting room. But where you can find them is at the Garagiste Festivals, where you will find the winemakers and winery owners pouring their own wines and telling their own stories. You’ll be able to sign up for their mailing lists and even order their wines at the events. Keep in mind that the productions are small and usually not available retail. Each winery and winemaker has its own journey; some started as consumers, some as grape-growers, some are second generation in the wine business now doing their own thing. What they all share is that passion to make wine the best way they know how. You should definitely sign up on The Garagiste Festival website for updates as well as follow our reporting. Next week’s article will report on the wines we enjoyed most this time around.